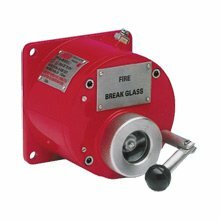 These manual fire alarm, emergency shutdown breakglass and pushbutton units have been designed for the most arduous environmental conditions. The units are both easy to install and maintain. Intrinsically safe Exia and flameproof Exd versions of each model are available. A choice of either stainless steel or alloy makes the range suitable for either the offshore or onshore industries. Exia IICT4 or Exd IIC T5/T6.